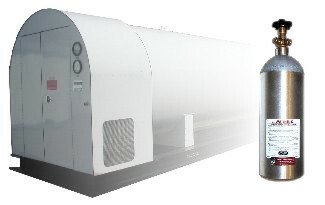 CO2 cylinders, CO2 tanks, bulk CO2"
We specialize in bulk and cylinder carbon dioxide and offer prompt cylinder delivery to your restaurant or other business location. Our fleet of bulk CO2 tank trucks are waiting to fill any size CO2 tank you may have, from 2-ton on up. Our specialized mobile inerting equipment is standing by and ready for your next purge job. If you own a restaurant or any other business that uses CO2 cylinders, our fleet of CO2 cylinder delivery trucks are standing by to give fast and friendly delivery. "We put the bubbles in pop." If you need to purchase a small CO2 cylinder for home use, or if you need to get yours refilled, come to our location and we can help with that, too.